This year that is about to end has been extremely busy for EJ advocates working to ban the hazardous organophosphate pesticide chlorpyrifos. For over six months the independent Scientific Review Panel convened by the Department of Pesticide Regulation (DPR) continued studying the danger of chlorpyrifos. At a hearing held on June 12, in Sacramento, this panel confirmed that this pesticide is a Toxic Air Contaminant (TAC). TACs are air pollutants that may cause or contribute to an increase in mortality and in serious illness, or which may pose a hazard to human health. Under orders from the Scientific Review Panel, DPR revised its chlorpyrifos risk assessment to show significant risk to infants and children exposed to chlorpyrifos applied as far as ½-mile (2,608 feet) away, as well as from food residues and water contamination. 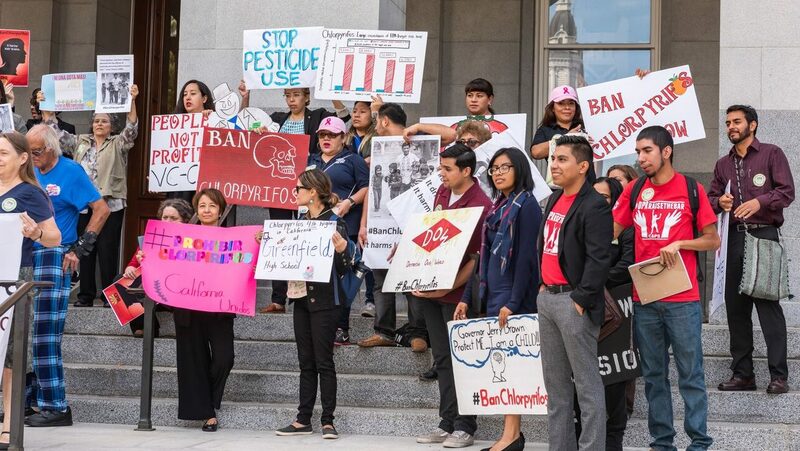 However, this was not enough for a large coalition of health, education and environmental justice advocates that spent months working to convince DPR to immediately suspend the agricultural use of Chlorpyrifos. CCEJN was an active partner in these efforts. First, by organizing in June 2018 a press conference in front of DPR’s regional office in Clovis. We also participated in an Action Day on October 4 at the State Capitol where we met with legislators to educate them about DPR’s inaction. Last but not least, we were part of the action that the Californians for Pesticide Reform (CPR) organized during the hearing held by DPR on November 8, 2018. A week later, on November 15, DPR announced a set of interim recommended measures aimed at limiting exposure to chlorpyrifos. In comments to the Associated Press, California Department of Pesticide Regulation (DPR) spokesperson Charlotte Fadipe described the measures as “short-term fix,” adding in a press release that a permanent fix would take two more years. EJ advocates pushed back against this timeline, noting that DPR should immediately halt use of chlorpyrifos in accordance with State law because it has “demonstrated serious uncontrollable adverse effects” and is “detrimental … to the public health and safety,” even when used properly. The battle will continue in 2019. The new administration, will certainly hear from CCEJN and all our partners. We were hoping California would be the first state to step up to protect its residents, but Hawai’i instituted the first state’s ban in June 2018. What more does California need to take action? We won’t stop until chlorpyrifos is out of our state!